That’s thirteen figures since 2014! On top of that, Walgreens was solely responsible for bringing a complete Fantastic Four team back to Marvel Legends. It appears that their focus has turned to X-Men ladies of late, so let’s take a look at Mystique! First off, it seems as though this year Hasbro is doing away with the toy pictures on the back of their Marvel Legends boxes. Instead, we get a shot of the actor or an artist’s rendition of the character. This has been the case with the latest Black Panther and Captain Marvel waves, so I’d assume it will continue going forward. You would have to go all the way to the Toy Biz 2005 Sentinel build-a-figure wave for the last Mystique in her classic white dress with skull belt. Like most Toy Biz women action figures, she wasn’t that great. Hasbro did a more modern version in 2013 that hand gigantic annoying hands, but that is best forgotten too. I still have that Hasbro Mystique somewhere, but she really wasn’t even worth digging up to make comparisons. Mystique looks to use the same body as Polaris, minus the hands and head. It’s actually kind of a shame they didn’t include a second set of open hands from the Polaris mold but in white. Mystique’s hands pop off fine, so you may be able to get away with stealing a few hands from Gwenpool. If my Gwen wasn’t in storage I’d give it a try. 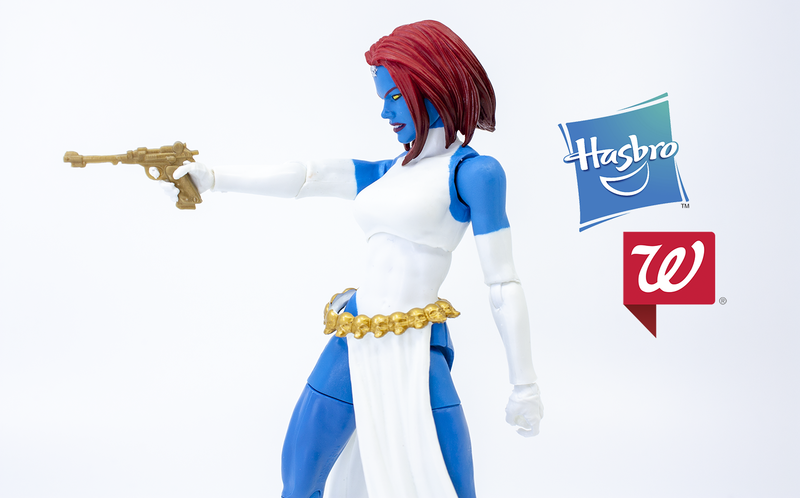 What Mystique does come with, however, are two hands with trigger fingers that can we use to hold the pair of bright golden guns she includes. I suppose it’s a fashion thing, she wanted her guns to match her belt. It’s going to be hard to ever beat this Mystique head sculpt. It’s so good! Her hair has a gorgeous color fade from light to dark red. I feel like she’s a very easy character to age if you aren’t careful with the sculpt, but they found the perfect spot where she doesn’t look too young or too old. She also includes two additional heads: a half-blue Rogue and Lilandra head. Now she’s a shapeshifter, so in theory, both could just be used for her. But the Rogue head fits fine on the Juggernaut build-a-figure series release. Unfortunately, the paint on the Rogue head is a little sloppier than I’ve come to expect with Marvel Legends. The Lilandra head is pretty good but it’s in a bit of a weird spot of where to put it? For now, she’s going to rest on Silver Sable’s body, but I have a feeling Hasbro has a full figure planned that this head can be used with. That’s my gut feeling anyway. Would I suggest Marvel Legends Mystique? Yes, of course. Not only is she a superb figure, but she comes with a bunch of fun extras. I got ahold of Mystique a little early, but she is a Walgreens exclusive and is expected to start hitting their stores this Spring. So in preparation, go buy up all those Medusas and Paladins from last year that are clogging the pegs.